Thanksgiving is all about giving thanks and remembering wonderful times in your life. There is a sense of joy when the company and the atmosphere is right. This year, I did not spend Thanksgiving with family or friends. I spent it with something that gives me joy and provided me with good tidings and wonderful memories. This Thanksgiving, I spent it with a pickup truck. At this point, I should tell you a story. Since I began this part of my career trajectory, I never thought that a pickup truck would bring out a happy disposition to my soul. I love performance cars – true. Some better than others. However, there is nothing like a full-sized, half-ton pickup truck…and, on occasion, heavy duty ones…that makes this suburban-born-and-bred, middle-aged, Jewish, gay, and single (again) man a very gleeful fella. I said it once – and I’ll say it again – though I am not as well versed on pickup trucks as some of my colleagues. I have never towed and pulled a full load in the box to determine whether an engine stands up to its Gross Vehicle Weight Rating. I do not use a truck for work or on a farm. I am the least likely demographic to own one. However, I love trucks. I love working with them. I love driving them. Having a pickup truck for Thanksgiving and to work with during the several days afterwards is a reason to skip Black Friday. Why do I want to stand at some big box retailer at 5:00AM to get some big screen television or gaming console at its lowest price ever – when I don’t need them. I’d rather jump in the truck, drive around, and laugh at the poor souls who are emptying their wallets and increasing their debt. 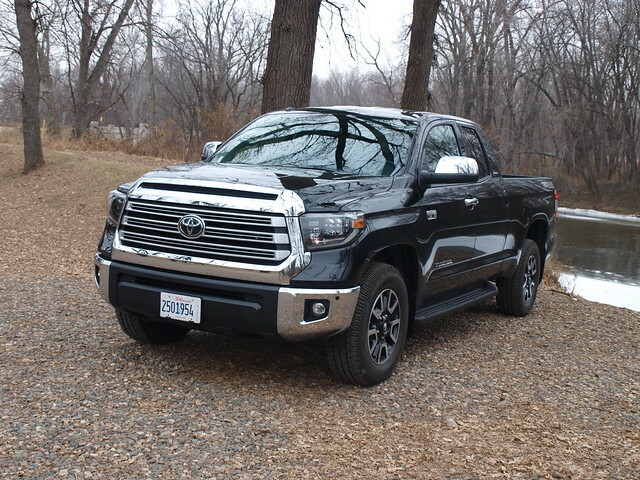 The truck that I have at my disposal for the day of Thanks was a 2019 Toyota Tundra 4X4 Limited Double Cab with the TRD Off Road Package. In black. A luxurious black at that! That’s something to be thankful for. There is a lot to talk about but let me break down the truck itself. 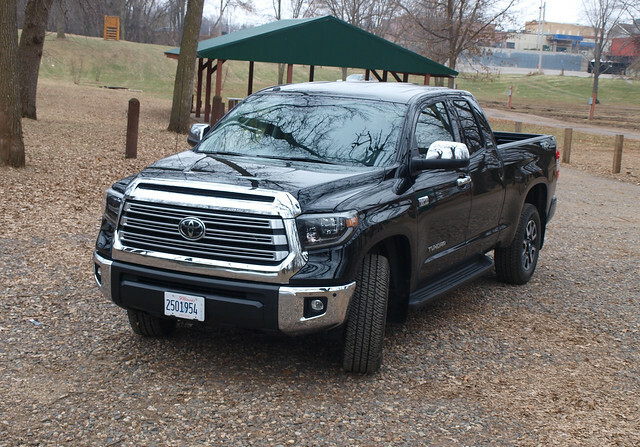 The Toyota Tundra is truly the unsung hero of the full-sized, half-ton pickup market. While General Motors and Fiat Chrysler Automobiles trotted out new versions of their volume-selling wares, Ford is still making a mockery of American automotive market by selling more F-150s than anything everyone else have come up with. The Tundra is a strong truck. It may not have some of the numbers that its competition offers, but the big San Antonio-produced truck offers plenty for truck buyers to consider. The i-Force 5.7-liter V8 is nothing to scoff at. It provides pure torque and solid power that truck owners want. The Tundra is made on a strong frame with a cab that is more distinctive in Double Cab form. Toyota’s four-wheel drive system is superb. A few more TRD add-ons make it track superbly off-road as well giving you a soft ride on the highway. If you are unfamiliar with trim levels on each full-sized pickup, the Tundra’s Limited trim matches up with Ford’s Lariat, Chevrolet’s LTZ and Ram’s Laramie. It is a truck that is premium, but attainable for those looking for a bit more luxury than its more popular trim. The leather seating feels durable and the materials are of a better quality. The Tundra Limited is that happy medium between the popular SR5 and the more luxurious Platinum and 1794 models, while offering good value in its segment. The Double Cab is something I want to explain more. When the first extended cab trucks came out – the 1973 Dodge D-Series Club Cab came before the Ford F-Series Super Cab – they were designed for extra secure stowage, while providing some additional seating for passengers in the extended rear compartment. Back then, consumers and commercial customers would select the regular two-door cab before anything else – including crew cab models designed specifically for work-ready applications. The extended cabs from Dodge and Ford were proven popular that Datsun added a similar cab to their compact pickup truck a couple years later – the King Cab. Toyota introduced the Xtra Cab to their compact pickups a couple more years later. In both the compact and full-sized pickup segments, have more space behind the front seats became a very popular choice for consumers. Nowadays, the Crew Cab is the more popular choice among pickups in all classes. The true four-door cab was seen as a way to keep the family together while maintaining the capabilities of a pickup truck. The extended cab lags behind the crew cab in terms of popularity. This is the part where it gets interesting. There are two thoughts on extended cabs among full-sized pickups. Ford and Nissan went to a “suicide door” format, where the rear “door” is hinged at the back of the cab, providing a very wide opening in the middle to the front and rear compartments. It works perfectly for convenience, but it lacks the B-pillar which will affect the structural integrity of the cab. GM, FCA, and Toyota has their rear doors hinged at the B-pillar, which is structurally more rigid and provides an extra edge on safety against a side collision impact. Luckily, Toyota’s rear doors open very wide and offer plenty of access to the rear compartment. The Tundra’s CrewMax cab already offers extraordinary rear seat leg room – practically like an extended wheelbase flagship sedan. If you were wondering if there is an advantage between a CrewMax or Double Cab, a look at the tape measure and the weight scale could help. They both ride on the same wheelbase, while the Double Cab has a foot longer box than the CrewMax. They are also the same overall length. The CrewMax is heavier by 150 pounds yet has a 50-pound disadvantage on payload. The Double Cab has a higher maximum towing rating – by 300 pounds. In Toyota’s Double Cab, you get a lot of covered and secured space behind the front seats. The cushions fold up for extra space yet said cargo will be sitting on the stowage for the tire replacement kit – the jack and other related tools. The carpeted part has a slight “transmission” hump but offers a lot of footwell space for three in the back. Rear legroom is OK – better for average-sized adults and children. Folks with tall torsos may opt to sit up front, as headroom may be limited in the back. The rear seats themselves are thick and comfortable. 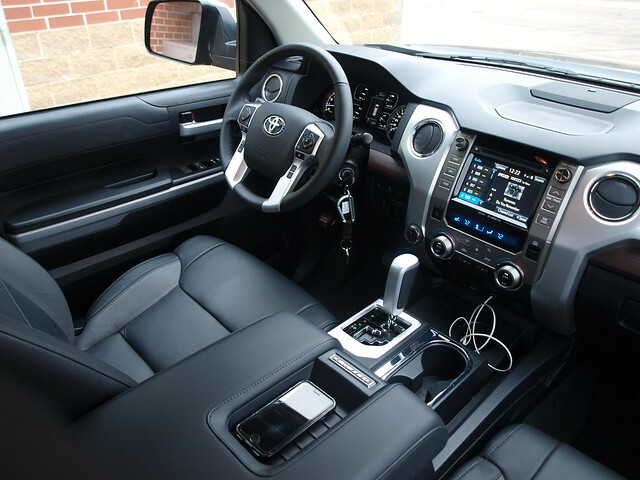 One feature that I love on the Tundra is the gated console-mounted shifter. As the world moves on to knobs and buttons, there is nothing like the feeling of moving a real honest-to-God shifter through a gated channel quickly to get out of a tight parking space – or to roll through the countryside. The six-and-a-half-foot box is the right size for most jobs. Uncut pieces of plywood may have to ride with the tailgate down (with tie downs and a red flag out back). But, I can think of many uses for the longer box with the Double Cab that are more useful than the usual CrewMax model. Truck people may want to consider this configuration if a crew cab is not required. During my time with the Tundra Double Cab, I wanted to see how it fares in its natural habitat – out in the countryside. 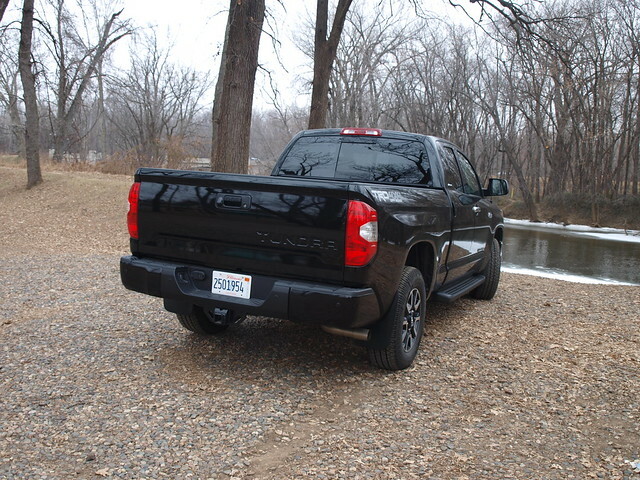 But, first, the Tundra had to deal with suburbia – especially on Black Friday. It goes back to a point made earlier in this article. The idea of a pickup truck is to do work. Whether it is getting supplies to a job site downtown or helping out at the farm, a truck is primarily used for the utility it provides when getting tasks done wherever it is employed. When a pickup truck becomes one where it is used for non-work tasks – commuting, tailgating, towing the boat to the lake, and so forth – then, we try to imagine our trucks to act like amenable for personal use. That could be a blessing and a curse. We must remember that a truck is normally larger than the average sedan or SUV. We know that they do not fit at supermarket parking lots perfectly alongside everyone else. We know that finding the right spot at a crowded shopping mall will man extra work for a pickup truck. Let’s not fantasize that a pickup truck was designed to replace a car or SUV as the personal vehicle of choice. However, there should be no excuse for those of us who know how to drive a pickup truck to use them wherever we want to take them. Right? Let’s go back to Thanksgiving for a moment. 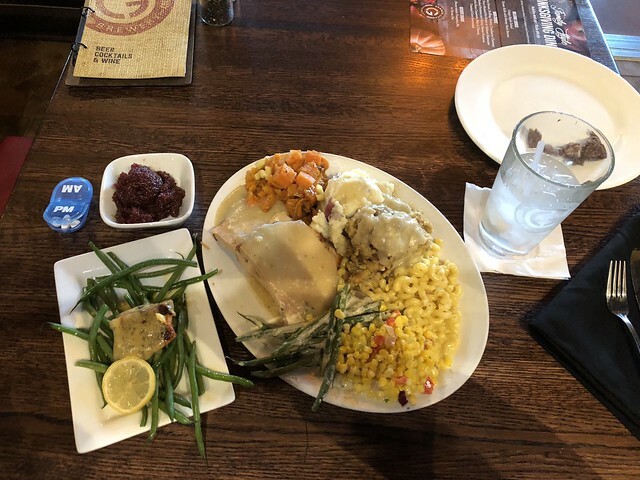 I did take it to the countryside before my solo feast in Maple Grove, Minnesota (thanks to Open Table and Granite City). My point was to assure its place in its home territory. A lovely drive north of Elk River on a mix of highway and secondary roads showed that the Tundra does well in its intended habitat. It does get a bit bouncy, but doesn’t that remind you of pickup trucks past? That is exactly what the Tundra feels like. 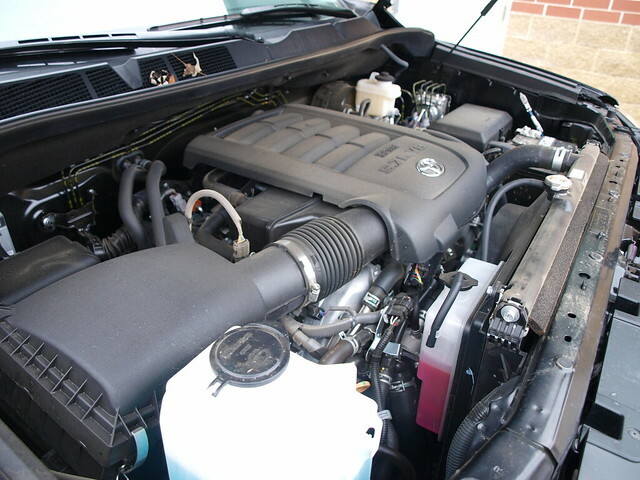 If you have driven a pickup prior to the 2008 (Dodge) Ram 1500, then you recall how engines were supposed to give you a pulse that speaks to its capabilities, a leaf spring ride that is made for load and towing control than a luxury ride, and that feeling of superiority on the road – because you have a pickup truck and everyone else needs to respect your presence in certain landscapes. Because this is also a review, I must talk some numbers. In terms of fuel economy, I averaged 15.0 MPG. I hope that improves when Toyota creates the next generation Tundra – eight-speed automatic, anyone? As for the sticker price of this Limited Double Cab – how about $46,610? Granted, it is less than the magic $50,000 that has a lot of pickup customers scared to buy one. Yet, one must take a very good look at this truck to determine whether it is worth the sticker price. Consider this: It is a Toyota Tundra Double Cab adorned in a luxury trim with an off-road upgrade package. Price similar pickups out and compare. There is one final question to consider: If it were me, would this be my pick for a full-sized half-ton pickup truck as configured? Probably. I still would want a box over six feet long for better cargo management, so an extended cab would work fine. Yet, I would like a crew cab, but lose a foot in the box – that if I wanted a longer wheelbase version available from at least one manufacturer. Or, a three-quarter ton pickup. Toyota Tundras are known for being solid pickups with strong frames and a bad-assed V8 engine. One you can feel whenever your foot hits the accelerator pedal. This is the kind of truck where you could care less if you had advanced towing technology or a different way to select gears and such. This is my kind of truck. Just right for Thanksgiving. 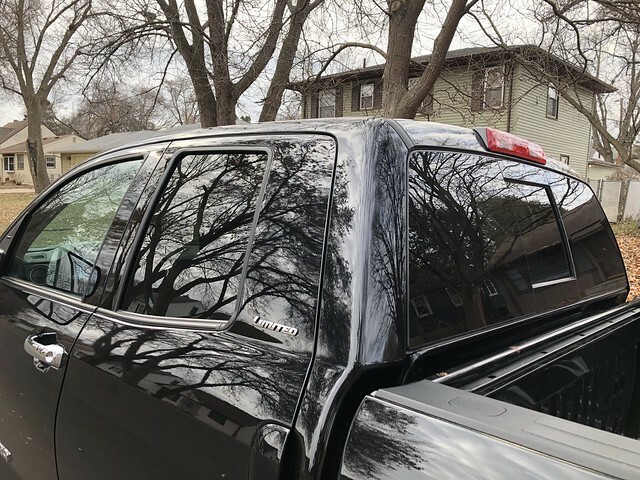 EDITORIAL NOTE: If you want a better perspective on pickup trucks, check out my colleague and friend Tim Esterdahl’s YouTube channel called “Pickup Truck and SUV Talk Plus” and his website. Tim is a great resource for pickup trucks and you will love his content. Tell Tim I sent you!